Sunshine Through the Rain: One scrappy, one planned. A finish today with this baby quilt I made using only scraps. Rachel at Stitched in Color has been motivating us over the last couple of months to use up our scraps, and so I jumped on board and I couldn't be happier with the result. I gathered all my blue/aqua, orange and grey scraps and got to work cutting strips, or joining scraps together to make strips and then sewing these together to form blocks that were 12" square (I took the idea from here). 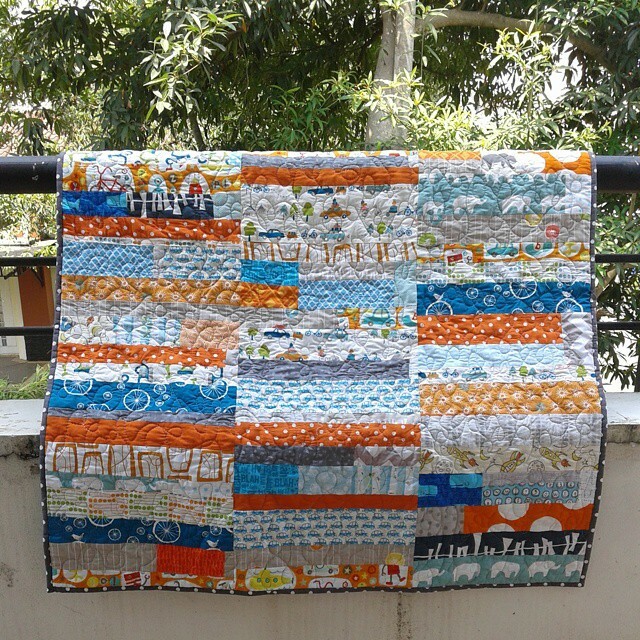 I then joined 9 of these together to make this small quilt - perfect for a little Indonesian baby! I decided that, after practicing FMQ for a couple of weeks on scraps of fabric, I just needed to jump in and try to FMQ this one. I attempted a meandering loop, and I was very proud of the finished result (and I couldn't believe how fast it was!). Obviously there are lots of imperfections, and I struggled with the lack of throat space on my machine, and with uneven motion (I definitely need to get something to help me grip the fabric better), but it looks great as an overall impression and I love the texture it gave the quilt. 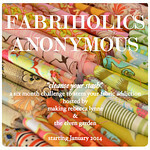 I see more FMQ in my future! As a complete contrast, this week I also finally put together a quilt top that I have been working on for the past year. No scrappiness here, instead lots of precise embroidery and piecing. 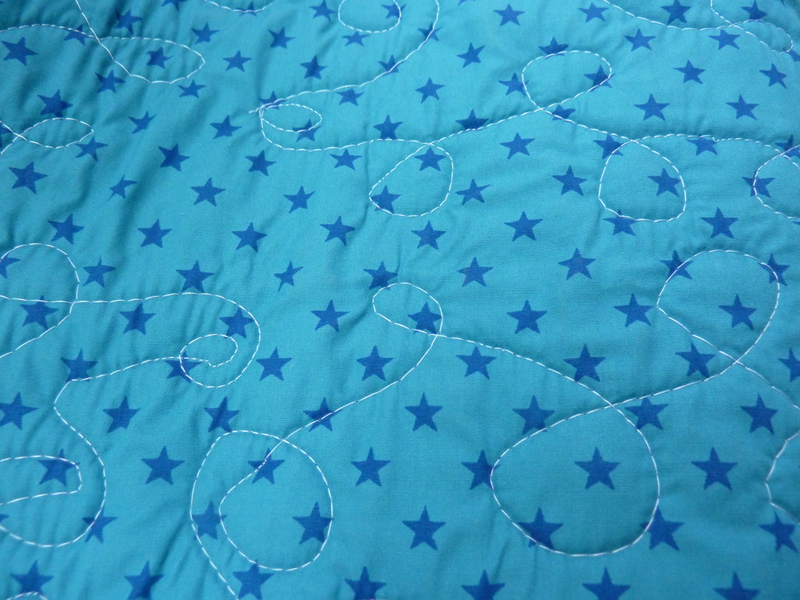 I loved making this, and want to thank Liz for suggesting and co-ordinating the ABC sew-along. I don't think I would have finished it without her encouragement. I am going to hand quilt this one, so it won't be finished for a little while yet, but I have a recipient in mind (depending on whether the baby is a boy or girl!). Linking up with I Quilt Thursdays, TGIFF, Finish it up Friday, The Purge and the ABC Quilt Wrap-Up. Your scrappy quilt looks so coordinated and planned! Your FMQing on it looks great. And congratulations on finishing the top of the ABC quilt, too. You've had a great week! Your scrappy quilt is great. What an awesome idea. Your FMQ looks great. I love how I feel like I get better in the course of quilting a quilt. I feel you on the lack of throat space. My Viking has a 7" throat. I use Leah Day's method of working from the center out to the sides and back and then filling in the corner quadrants. you have been busy sewing this week! i have made a similar blue, aqua, gray, and orange quilt! i think your fmq looks great and i will only get better!! ABC quilts are always a favorite of mine and yours is precious!! i think hand quilting will perfectly compliment it!!! They both look great! Super impressed with your FMQ - well done for taking the plunge! I'm still waaaay too scared and need A LOT more practice! And your ABC quilt top is just lovely. It is definitely something on my future to-do list! 2 wonderful quilts!! Did it feel as though your scrap quilt used many scraps? Whenever I make scrap quilts it amazes me how little fabric they seem to use. Your alphabet quilt is just so lovely. Each of the embroidered prictures are so sweet and I love the overall colours you've used. Both quilts look wonderful. You have carefully chosen your colour palette, even for the scrappy quilt. Have you tried some grippy garden/cleaning gloves to help with gripping the quilt? Fabulous finishes! Great FMQ too Deborah :) I can definitely recommend Machingers gloves for machine quilting, they give you really good grip on the fabric. I love the colours in your scrappy quilt, and I'm impressed you jumped on in and FMQ'd it. Your scrappy quilt looks lovely. Thank you for the tip, I must try this one too. Lovely to see your embroidered quilt too, what a precious gift for a little one. Looking forward to seeing more of it! Lovely quilts, both of them! I find free motion so difficult! Great job on your FMQ, that's impressive. Both quilts came out beautiful. Wow both gorgeous finishes! To help me grip my fabric better when fmq'ing I wear washing up rubber gloves. They work a treat! 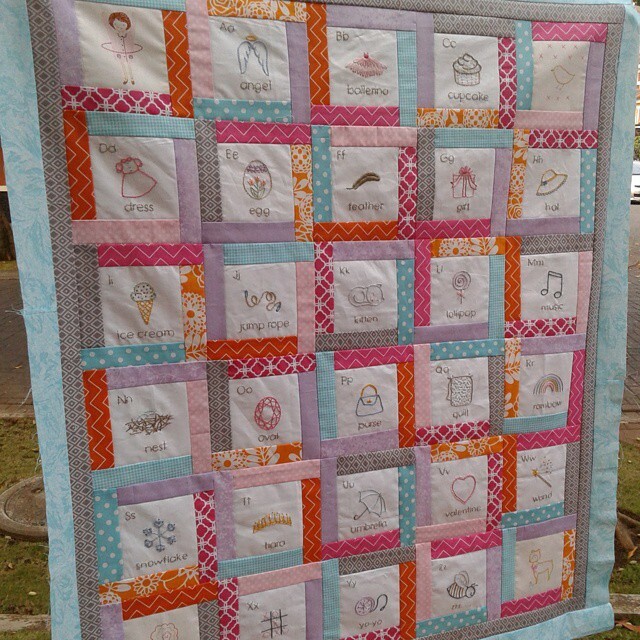 I love love love your ABC embroidery quilt! I made the boy version, but after seeing your's and Liz's girl versions I must make one too. Well done! Yay! Yay! Yay for the quilting! You did a great job with it, Deborah! Woo hoo! Well done you for FMQ-ing a whole quilt! Feels good doesn't it?! There's no stopping you now :) I've loved watching your ABC quilt grow. The FMQ looks good! Gardening gloves to help the FMQ grip next time? I got mine from Bunnings here, but I am sure you can find something similar in Indonesia – no fancy quilt shop needed. Mine are fitted gardening gloves with a plasticky grippy palms and fingers. I love the embroidered ABC quilt. I knew I would from the earlier sneak peeks. Your FMQ looks great, I need to be brave like you! I am encouraged about your comment about how fast you found it, that's something that always puts me off. And I love your ABC quilt, I knew I would! It really is gorgeous and will be something to be treasured. 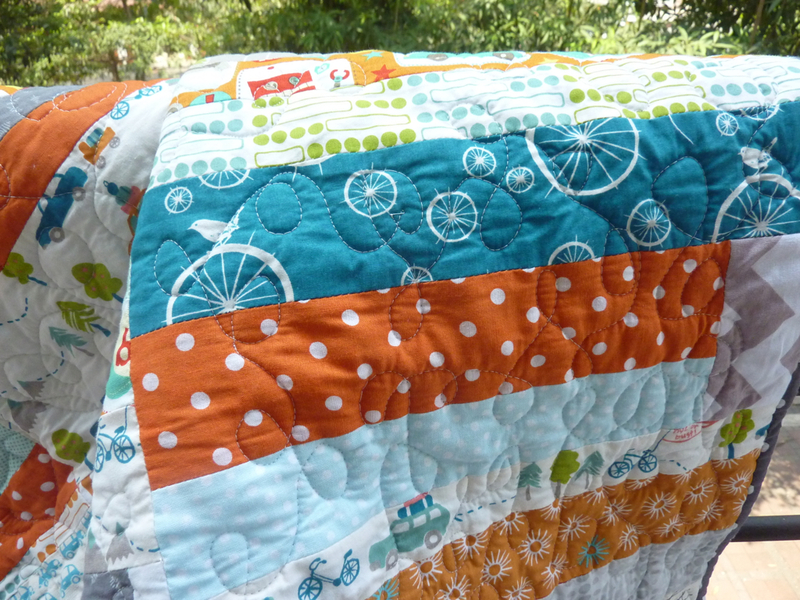 Your scrappy quilt is gorgeous! I just love those kind of quilts and it just begs to be wrapped around someone. So nice to visit you today, Deborah. I am in awe of the embroidery work on your abc quilt. Such a treasure! Keep up with your FMQ. I'm glad you jumped in. It will just get easier from here! Your scrappy quilt is fabulous!! the embroidery on that ABC quilt is pretty awesome.